icanhasgrace is a statement, a plea, a demand, and a prayer. icanhasgrace is about finding grace in everyday life. 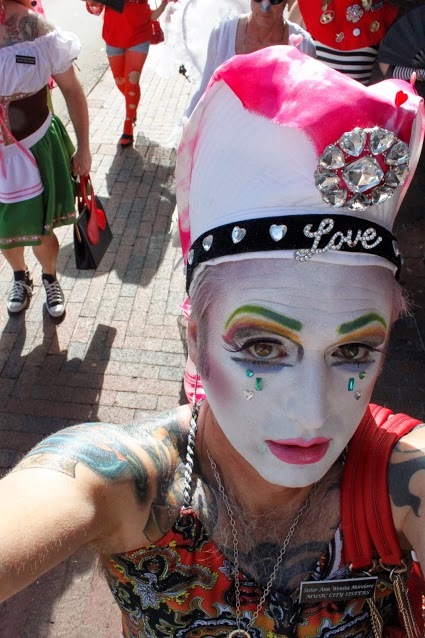 icanhasgrace is about living my calling to inspire joy, end guilt, and be love as a Sister of Perpetual Indulgence. icanhasgrace is my attempt to share my passions. My name is Doug. I live in Nashville, Tennessee. I’m a web editor, partner (such a strange word. It makes me think of cowboys and business arrangements), and father to four wonderful (now adults!) children. I am also known as Sister Ann Wenita Morelove of the Music City Sisters of Perpetual Indulgence. . I think this is lovely. I love the last line “Because when I get sidetracked…”. So you. The camping trip with the kids looked fun! Great looking pancakes. I doubt that you remember me and my family but I went to your church in Counce Tennessee. The really trying one. I was the converted catholic that kept calling you father. Tina ran across your website and sent it to me. I am so glad that you are doing so well and are happy. The last I heard of you, you were going through some VERY hard times. The kids are so grown. It is still a shock even though mine are 19 & 16. You knew Hayley as a 2 year old but never met Zach. You had a significant impact on my life of which I am still very grateful. Both Tina and I wanted to say hi. We are now living in Summerville South Carolina. Hayley is finishing her first year at North Greenville University, a Baptist University. Yes we are currently Baptist. We made the move because the church was really good for the kids. God sent here there. I say this because he provided the money. Zach is a sophomore in high school and is very active in the NJROTC. That is the Navy Junior ROTC. Well I have to get back to work, I just wanted to say a quick hi. It’s good to hear from you. It sounds like your family is doing well. Time flies, doesn’t it? Please tell Tina I said hello. …and grace can be found in everyday life, all we have to do is be open and we will find it or it us. Absolutely! Things get out of wack for me when I forget that. Dahlink, I came back here to review this that I read and replied just about a year ago. You need to update it now…the strange word, partner, is no longer that word. You are a husband. What a difference a year makes. For in a year we have found even more grace. Cheers!